The art of arrangements and transcriptions is as old as music itself, but with the passing of time it evolved into a form that could almost be considered as original as the works it sought to serve. By the 19th century arrangements and transcriptions were an integral part of the music structure of the age, but in many instances only works by famous composers were considered for such experiments. 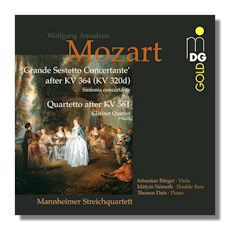 Naturally, Mozart's works were often the choice for these particular forms of artistic imagination, and this disc couples together two of the composer's most beautifully articulated pieces: the Sinfonia Concertante, K. 364 and the Clarinet Quintet, K. 581. The former was arranged as a Grand String Sextet, while the latter took the form of a Piano Quartet. Unfortunately, the musicians that embraced these undertakings are unknown, but both pieces are assumed to have been arranged in 1807 and 1802 respectively. Whatever the circumstances of the case, these arrangements are definitely the work of a consummate master who knew his trade to perfection, as the freshness and inventiveness of the originals are brought to light with even greater clarity, and the melodic and rhythmic lines are totally faithful to Mozart's markings. Performances are colourful and imaginative, and the sextet in particular has an air of cheerfulness that consistently delights. This is an unusual disc in the best MD&G tradition of sound and presentation.